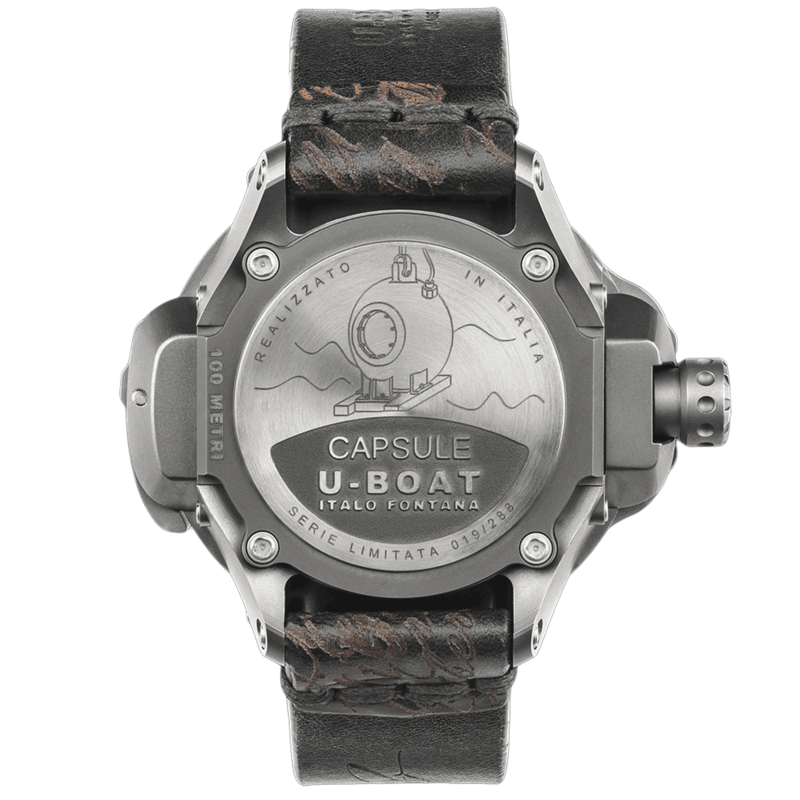 Directly inspired by the first undersea exploration modules made in the early ‘30s, Italo designed the Capsule watch with spherical portholes made from water pressure resistant hesalite glass. This watch uses a patented system to clamp the glass to the grade 5 titanium case. 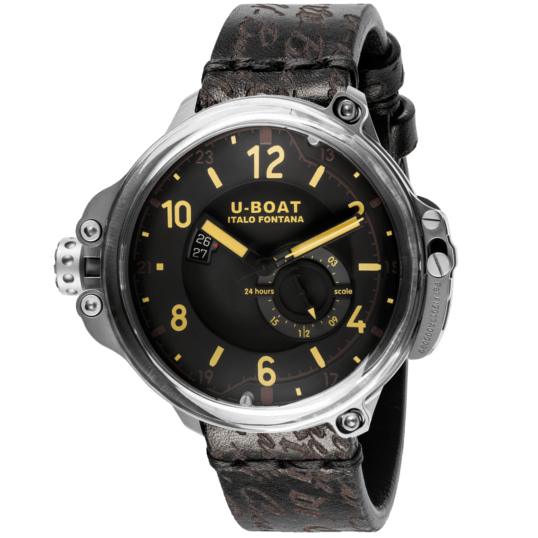 automatic mechanical movement, personalized to U-BOAT specifications for stem to be positioned at 9 o’clock. hours, minutes, seconds, 24h indicator, date. grade 5 titanium case, thickness, 23.3 mm. 50 mm diameter, overall dimensions 63 mm. The two-piece case (middle and back) is joined by screws and has no bezel, which is replaced by the glass itself. Special titanium screw crown positioned at 9 o’clock, designed and manufactured according to U-BOAT technical specifications. The release mechanism on the right side of the case provides easy access to the dial and component parts. A special titanium ring guarantees an airtight seal and total water resistance. The ring is also fixed in place with 2 screws on the lugs for greater resilience and security. attached by 4 screws for rapid access to the movement for adjustment purposes. black three-level dial with numbers and hands treated with luminova, date indicator at 9 o’clock. a naturally distressed look and feel. Finishes made with waxed cotton. Titanium tongue buckle. Width: 23/22 mm.